***UPDATE*** The giveaway has ended. And the winner is…Jen Mascaro!!! Congratulations Jen, and a big thank you to everyone who entered! I am so excited to announce a special giveaway for Maternity Week! 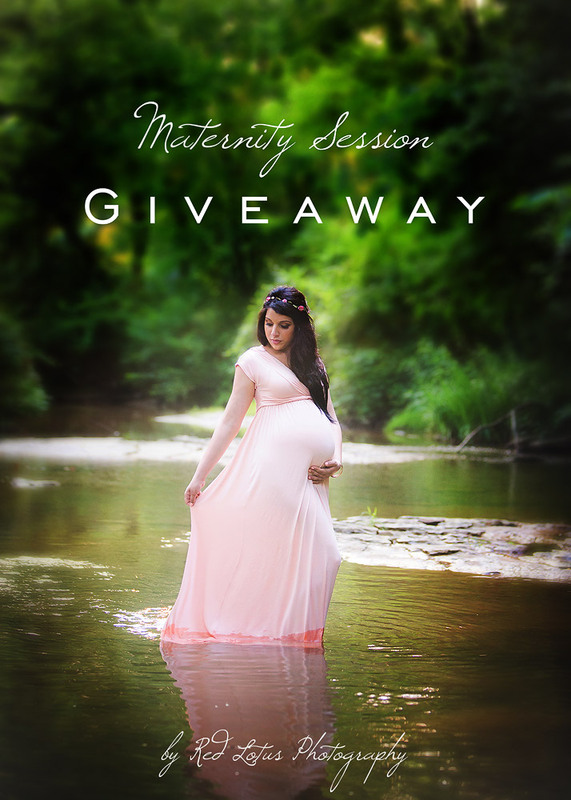 I am giving away a FREE Maternity session, plus a very special treat that I am over the moon about – the session will include styling services by Maternity Girl! That is a total value of $1075!!! It’s super easy to enter, and you can add bonus entries more than once by coming back every day until the giveaway ends Friday, January 9th at midnight. Winner must claim the prize within 48 hours of announcement; after 48 hours the prize will be given to the second place winner. The photo session must take place at the Red Lotus Photography studio, or within a 30-minute driving time from downtown Pittsburgh. The session must take place no later than August 31, 2015; after this date the prize may be nullified at the studio’s discretion. Prize is not redeemable for cash, and is good for a maternity session only. Winner must sign a model release. Prize may be transferred to another person; all terms and conditions apply. Ok, so now that you’ve read all the fine print, it’s time to call on Lady Luck! It’s easy to enter – just let Rafflecopter lead the way. Winner will be announced on Monday. Good luck!! Amanda Taylor - I would love to win. I never understood the value of maternity pictures until AFTER my son was born. Even though I had my “pregnancy glow” with my son, I just didn’t feel pretty enough to get pictures done. I always had an excuse. Now it is something that I wish I would’ve done with my first child. Danielle Maley - Thank you. For having this contest. Mary goosev - Entering for my daughter. Sandy - Thanks for stopping by to comment! Good luck! Timara - Amanda I know what you mean. I hated the thought of getting them done with my first one but my mom bullied me into it. It wasn’t until I saw those pictures, that weren’t well done, that I realized the beauty of the woman’s body. This time around I went to Sandy here at Red Lotus Photography and they were so beautiful I cried when I opened them! I wasn’t even still pregnant because we waited til I only had a month left. I love them and will be returning for more. Kelly Phillipps - Entering for my little sister she’s due in July!! Sandy - Thanks for your comment, Harley! I know what you mean; I didn’t get them done when I was pregnant with my daughter, either. I really wish that I had, because we had a hard time getting pregnant, and she’s my only child. There’s no going back! Justine - Im pregnant with my first and I would love to win this. Maternity photos are so beautiful. What a wondwrful time to remember. Its so amazing how beautiful pregnant women are in a society rhatbis so obsessed appearance. Its great to celebrate such a beautiful moment. Ashley abdrew - Your photos are just beautiful! Jenna - i was so sick during my pregnant with Kayden I couldn’t even think of doing a shoot. After having sandy do our newborn shoot and the love and magic she captured I can’t imagine not having her capturing our second pregnancy. She’s absolutely unbelievable!!! 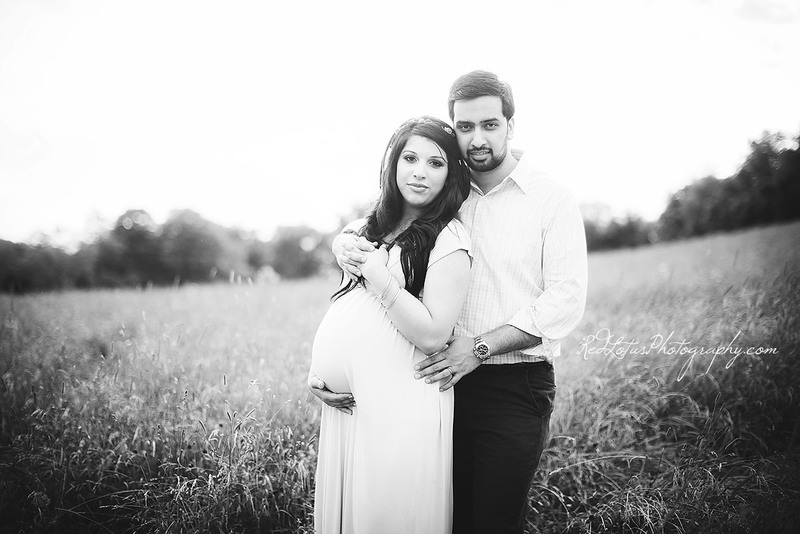 I am smitten with Anika and Nabil’s maternity photos, which were taken this summer in a beautiful outdoor nature setting. All the elements I love were present – soft grassy field, sparkling creek, setting sun, and a sweet couple who were adorably affectionate towards each other. They said the most lovely words when we were planning the location for their pregnancy photos – “whatever you want to do, we trust you!” Ahh! I love to hear that! They were both such good sports about braving the bugs to follow me through very tall grasses, and letting their clothes get wet as they walked through the creek. Oh, if only I had someone there to take a pullback photo, dear Reader! I was soaked by the time we got out of the water, but I didn’t care. It’s one of those things that may seem kind of odd to people when you’re doing it, but the end results are just magical. Thanks for trusting me, Anika and Nabil. If you are looking for a Pittsburgh baby photographer or maternity photographer, please contact Red Lotus Photography or visit the investment page here. Newborn photos are usually scheduled to take place within the first 10 days of birth, so if you can, please plan ahead and call Sandy before baby is born! Red Lotus Photography specializes in baby photography, newborn photography, maternity photography and children’s photography in Pittsburgh, Fayette, McMurray, Canonsburg, Bridgeville, Peters, Mt. Lebanon, Upper St. Clair, Shadyside, Wexford, Sewickley, and other areas surrounding Pittsburgh. Sandy offers children and newborn photography in her Pittsburgh photography studio . For more information, please contact Sandy here. It’s a new year, dear Reader! And that means new resolutions, right? My business New Year’s resolution is to catch up with my blogging, with which I am woefully behind. 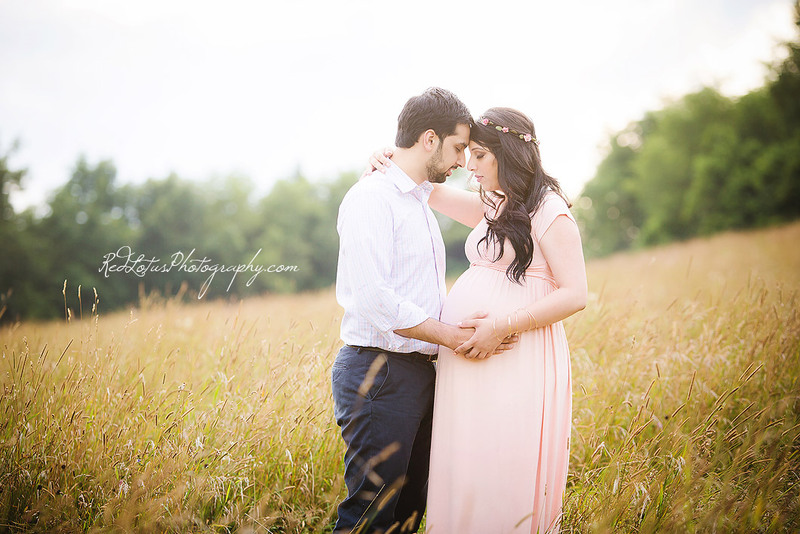 So many beautiful maternity, newborn, baby, and children’s photography sessions to share with you! Rather than do everything chronologically, I thought I would break things up by category. Therefore, I deem today the beginning of “Maternity Week”! Here’s a couple that I just adore, Kelly and Beau. Such chemistry between these two! Dear Reader, whatever you celebrate, our family wishes you and yours an abundance of peace, love, and joy this holiday season! A big thank you to my friend Kristi at Kristi Ternullo Photography for taking these awesome photos!! I think parents who have twins are pretty amazing; Michelle and Ryan were adjusting to two babies and handling everything like champs! Look whose eyes are wide open again! If you are looking for a Pittsburgh newborn photographer or maternity photographer, please contact Red Lotus Photography or visit the investment page here. Newborn photos are ideally scheduled to take place within the first 10 days of birth, so please plan ahead and call Sandy before baby is born! Red Lotus Photography specializes in baby photography, newborn photography, maternity photography and children’s photography in Pittsburgh, Fayette, McMurray, Canonsburg, Bridgeville, Peters, Mt. Lebanon, Upper St. Clair, Shadyside, Wexford, Sewickley, and other areas surrounding Pittsburgh. Sandy offers children and newborn photography in her Pittsburgh photography studio . For more information, please contact Sandy today. I want to thank my friend Elena at Maternity Girl for allowing me to post these beautiful moments of her and baby. Stay tuned to the end of the post for a special offer just for breastfeeding (and bottle feeding) mommas! When my daughter was just a baby, professional photography was not a part of my world yet. I was very much a newbie; my husband had just bought me a “real” camera, a digital SLR, and I was so excited. Suddenly I had this great tool, and I wanted to capture every little thing about my precious baby, document every moment, from the milestones to the mundane. I’m so glad I was able to take those pictures, because now I look at them and they take me right back. I remember how fuzzy and soft her hair was, like a baby duckling. I remember how I loved to kiss those pudgy little toes. I remember how she was so small, that when she fell asleep on my husband’s chest, he would zip his fleece jacket around them both so she looked like a kangaroo in a pouch. I have photos of all of these things, so special to me, things that I never want to forget. But do you know what I don’t have? Pictures that capture the way I felt when I was nursing my baby. Maybe you’re thinking that it’s strange to want photos of that. Or maybe, you’re a nursing mom who knows exactly what I mean. The way your baby looks into your eyes as you give her nourishment. The little hand reaching up to touch your face; your hand and baby’s hand lightly playing in a way that I can only describe as something akin to dancing. The soft and quiet sound of baby’s breathing as he or she falls asleep with a full tummy. Feeding your baby, whether by breast or bottle, gives you a feeling like no other in this world. Have you ever looked down at your baby and wished that you could somehow bottle this feeling and save it forever? Wished that there was some way that photos could do justice to the intimate moment you were sharing with your child? I did. I knew that this particular time with my child was limited, and I wanted to remember it forever. I asked my husband, God love him, to take a photo for me; it did not turn out anything like I had hoped. I even went so far as to try and take a selfie with the camera–anything, anything to capture this feeling. I had no idea that there were photographers out there who would even consider doing breastfeeding portraits. I really wish that I had done some research on that. Well, I may not have had the opportunity, but you do, my dear Mommas–and I hope that you will seize it! Recently Elena had been feeling all the same things that I had been feeling when I was nursing my child. She wanted to preserve these memories, and so she asked me to do a breastfeeding portrait session for her. When she saw her photos afterward, she was so glad that she took the time to do it. “I really wanted to honor myself and this special time that I have with my baby,” Elena says, “and remind myself, no matter how far we make it, that I was able to do this with my little one.” You can read her post about her experience here. Elena and I got to thinking that between her mad styling skills and my ability to freeze time/document life for parents everywhere, that we could offer a special experience for mommas who want to honor this precious time with their babies, too. That’s why on November 15th, Maternity Girl and Red Lotus Photography will be hosting a breastfeeding mini session event at my studio! Each momma will have a half hour of styling and consultation with Elena, followed by a half hour photo session with me. Elena will have a lovely trunk show set up with a selection of stylish nursing apparel to browse; you’ll have the opportunity to wear some of these items for your photo session, too. We only have 5 spaces available, so if this is something you want to do, please contact me or Elena right away! She’s a little dancing sunbeam, her sparkling presence bringing light to everyone around her. It’s impossible to hold back a smile when you see those inquisitive blue eyes look at you with a twinkle, a mischievous grin forming as she climbs the chair and stands up high like a daredevil. Riley is one year old, and she’s ready to take on the world! It was a gorgeous day for a photo session at Phipps Conservatory. I love the expression on her face in this image, and the way her tiny toes danced along the edge. Children’s photography is as much about observation and letting kids be kids as it is about getting them to smile at the camera. I love their natural curiosity and fascination with everything. Happy First Birthday, little Riley!! Pittsburgh Children’s Photographer Sandy Yetter of Red Lotus Photography specializes in newborns, babies, and children in Pittsburgh and surrounding areas. To book your photo session, contact Sandy today. Ahh, can’t stand the cuteness!! Mark your calendars; fall mini sessions are now available for booking. I will be having these photo sessions on two dates, October 4th and October 11th; locations to be announced this week, but my plan is to have one day in the north and one day in the south of Pittsburgh. $450 includes a 30-minute photography session, 10 images on USB with reprint rights, and an online gallery. This is a great way to update your photos right before the holidays (which are just around the corner). Spaces are limited, so please contact me early to reserve your desired time slot! The October 4th minis will be held at Hartwood Acres mansion, and the October 11th minis will be held at Boyce Mayview Park in Upper St. Clair. Baby photos with siblings are always so sweet. The way big brother and big sister dote on the littlest one, showering him with kisses and trying to be the first one to hold him in their photos together–adorable. Here are a few favorites from little Gabriel’s newborn photography session. If you are an expectant mother and you want to capture this special time of your children together, come to my Pittsburgh photography studio for a family photo session in a relaxed atmosphere. My studio is located just a few minutes from the Pittsburgh Zoo, and has plenty of on-street parking. For the best results, try to schedule your newborn photos to take place within the first 10 days after birth. For more information, contact Sandy today.